Nothing says 1980 like a car lot with almost nothing someone in the cult of the automotive obsessed can drool over. Times were dark in the automotive world in 1980—the malaise era was in full swing and there weren't many cars to get excited about. 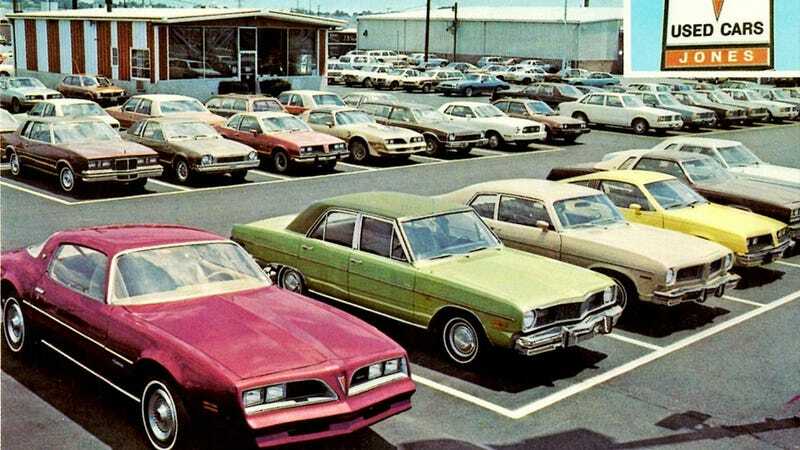 Things were no different at Jones Pontiac/Honda in Lancaster, Pa, as you can see from this picture taken in 1980. Their inventory was a sea of bland passenger cars, broken up only by what looks to be a pretty awesome gold 77-78 Trans Am. These days things are a little different at Jones Pontiac, although it is still in the same location (pictured here a few years ago). With the death of Pontiac the dealership became Jones Buick/GMC. Their Honda dealership is now a separate operation right next door. Although all of the cars on the lot today still aren't exactly exciting, they are certainly superior in most ways to the ones being sold 31 years ago. The same can be said for the lot itself—except of course for the missing disco era T/A.